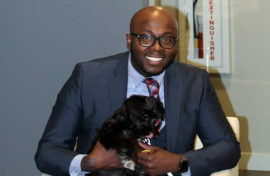 West Roxbury, MA (March 25, 2019) – Seeing was believing for Arthur Price when he took on a cross-country move from Los Angeles, CA, to Boston with the reality of finding a new home sight-unseen. Price accepted a new job as a healthcare administrator at Beth Israel Deaconess Hospital in Boston and bravely began his search for housing as many people do these days; he went online and initially thought he had found the right home. However, he became concerned as he worked with the property management company when they wouldn’t send him photos of the actual apartment unit while repeatedly referring him to their website. It didn’t feel right, and Price decided to continue his search until he came across Oak Row in West Roxbury. Via Facetime with the Peabody Properties team, Price discovered his potential new home and determined that it checked all the right boxes for his needs. New construction, quartz countertops, modern fixtures and a great location – all categories fit the bill. The Louisiana native knew that he was willing to live with Boston’s infamous winter snow, but he was not willing to shovel it or spend his mornings cleaning the snow off his car. The parking garage at Oak Row was a definite necessity. In addition, Parker, his miniature schnauzer, also made the move from LA with Price and is enjoying the dog washing and grooming station that keep him looking his best and the dog run for a bit of exercise. Price is thrilled to have an indoor storage area for his bicycle and use of the bike repair station. Price said his commute into Boston is great and he values the choice of options for public transportation. His new job enables him the perk of sometimes working from home and he finds the work pods and the conference center at Oak Row to be a great alternative to his kitchen table. Oak Row is located short drive from Legacy Place in Dedham and from shopping in Roslindale Village. Price enjoys walking and the West Roxbury community offers him easy strolls to great dining. Equipped with the technology of the day, Price found a positive cross-country house-hunting experience that yielded him a new home and lifestyle in a vibrant Boston community. 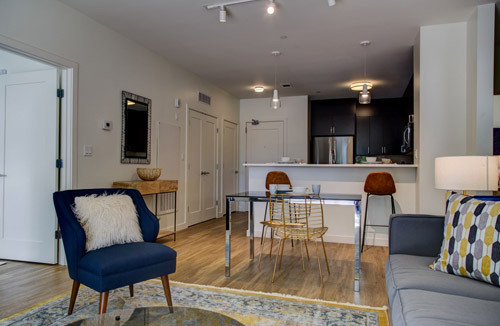 Oak Row Apartments, located at 1235 VFW Parkway in West Roxbury, has transformed the long-time vacant, former International House of Pancake’s Property into 80 luxury apartment homes consisting of a mix of one-, two- and three-bedroom units. The design intent of Oak Row was to embody the spirit of the beautiful tree-lined West Roxbury neighborhood, blending in with its natural, timbered surroundings. Oak Row is a community on the edge of the city, close to many conveniences: super markets, shopping, restaurants, cafes, coffee houses and entertainment destinations. Nearby Millennium Park offers walking and jogging trails, playground, canoe launch, ballfields and picnic areas. Residents can enjoy the convenience of going “car-free” with the MBTA commuter rail and bus service just minutes away. Complimentary transportation is provided to the West Roxbury rail station on Lagrange Street during peak AM/PM travel times and, for those who love to bike to work, there is indoor bike storage and a repair station. The community is LEED certifiable with project sustainable features that include energy-efficient appliances and fixtures and an environmentally conscious design. Building features include garage parking with several electric vehicle charging stations, pet wash and grooming station, private balconies/terraces, clubroom with kitchen and terrace, private work pods, work lounge and conference room, game lounge, package concierge, multi-functional wellness center and state-of-the-art cardio theatre, kids’ space, community deck, and Wi-Fi in all community areas. Oak Row features diverse apartment layouts and amenities that include kitchens with sleek custom cabinetry, quartz countertops, tile backsplash, stainless steel appliances, porcelain tile baths and showers, plank wood-style flooring, in-unit washer and dryer and LED lighting.